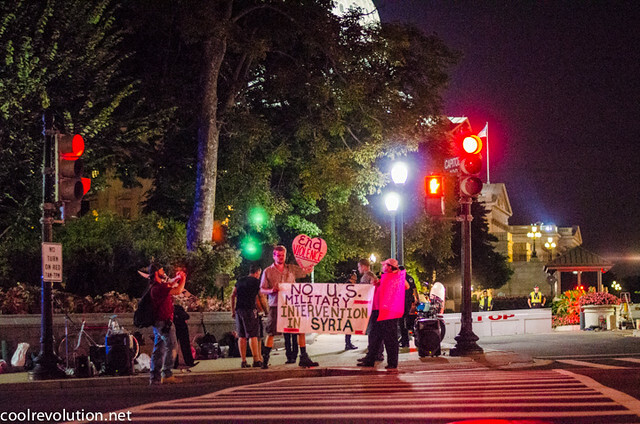 Activists from CODEPINK set up “camp” on an Independence Avenue sidewalk on Friday evening, just a few steps from the U.S. Capitol building. They had to clear out just a few hours later, but they’ll be back Saturday morning when their permit kicks in. After that, they don’t intend to leave until the House votes on the Authorization of Military Force in Syria resolution sometime next week. U.S. Capitol Police however were clearly uncomfortable with protestors hanging out on the corner so close to the Capitol building, playing loud music, dancing and displaying large anti-war banners. We need a March on Washington for Jobs and Freedom every bit as much today as we did fifty years ago. Depending on your stance on guns rights and gun violence, you may make a point to drop by your nearest Starbucks on August 9–or you may run as fast as you can in the opposite direction. Gun rights advocates want to show their appreciation for Starbucks and their friendly attitude toward loaded gun-toting patrons. On August 9, they’ll be holding rallies celebrating Starbucks’ policy of allowing guns in their stores in the 43 states which allow open carry. So far, according to the Facebook event page, 2,500 people have said they’ll go to their local Starbucks and bring their gun along. Starbucks is not “pro gun”, but rather neutral on the subject. This is really all we can ask as gun owners and carriers of any private business. So, in opposition to the boycott and to show support for a company which respects the Constitution and state laws, gun owners are encouraged to spend money with Starbucks on August 9, 2013 to show your support and offset any boycotts. Recent gun injuries and near-misses at Starbucks stores so far haven’t motivated the company to change its policy, which hasn’t been updated since March 2010. Incidents include a Florida woman’s gun firing accidentally in her purse when she set it down, wounding her companion in the leg. A similar incident occurred in 2011 in a Wyoming Starbucks when a .38 went off in a girl’s purse. A man was also shot in the leg in Houston just outside a Starbucks. While Guns Saves Lives describes Starbucks’ policy as neutral, it is far from such. Private property and business owners are not required to allow guns on the premises. Starbucks and other businesses are well within their rights to ask gun-toting patrons to leave or remove their firearms. For its part, Starbucks is pretending to be above it all: “Advocacy groups from both sides of this issue have chosen to use Starbucks as a way to draw attention to their positions.” In that whiny statement, they’re purposefully overlooking two things: ferocious battles over the 2nd Amendment have been going on for years, and almost 7,000 people have been killed by guns just since the Sandyhook shooting in December. Not asking customers to check their firearms at the door is a political statement. Starbucks also refuses to acknowledge that it’s placing its customers and employees at risk by allowing guns on the premises. Starbucks can’t hide behind a mealy-mouth corporate policy drafted three years ago. Rumors have flown for many years that DC police routinely infiltrate and spy on the frequent protests in the nation’s Capitol. But until now, activists have never been able to identify a specific undercover cop at a protest. 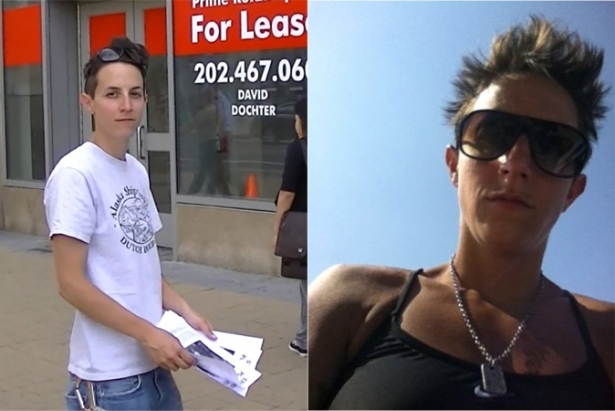 Now, after months of piecing together evidence, attorneys Jeffrey Light and Sean Canavan working with United Students Against Sweatshop (USAS) have confirmed that under an assumed name, Metro police officer Nicole Rizzi has participated in USAS protests against companies doing business in Bangladesh who refuse to sign the Accord on Fire and Building Safety in Bangladesh following the death of as many as 1,129 workers in the Rana Plaza factory collapse. Secretary of Defense Chuck Hagel issued a memorandum today effectively ending the furloughs of hundreds of thousands of Department of Defense civilian employees in mid-August. Mandatory one-day-a-week leave of the civilian work force will end five weeks earlier than scheduled–as well as their corresponding twenty percent pay cut. The furloughs were implemented in June as a Department-wide cost-cutting measure to cover a $11 billion shortfall because of the sequester, sweeping automatic budget cuts resulting from Congressional indecision. Active duty military considered to be part of the “war effort” were exempt from the furloughs, while 800,000 civil servants have been affected. At first, civilian employees were told to expect 14 days of unpaid leave starting in May. Later the furloughs were downgraded to 11 days from July 8 to mid-September. Hagel’s announcement reduces them further to a total of six days. According to Secretary Hagel, furloughs were among “limited options” to “close [the] gap” in the budget shortfall. Unsurprisingly, the twenty percent cut in pay resulting from the furloughs and its unequal application has caused dissension among the ranks. Congress has approved most of a large reprogramming request that we submitted in mid-May, giving us flexibility to move funds across accounts. The military services have been aggressive in identifying ways to hold down costs, and we have been successful in shifting savings (including furlough savings) to meet our highest priority needs. A memorandum Hagel issued earlier this week indicated that furloughs may be proposed again next year, or for as long as five years, in order to bring the bloated Defense budget in line with the President’s plan for reduction. The odds are high for furloughs continuing under a sequester next year as Congress has yet to pass a balanced budget, opting to allocate funds on the basis of continuing resolutions. The $85 billion sequester reductions are the result of a Congress unable to agree on how much to cut government spending or where the cuts should be made. Sequester has affected government services in a variety of sectors. In April, air traffic controllers were furloughed for several weeks, resulting in significant delays in air travel. The Friday before Congress was to travel home for spring break, they voted to approve a last minute re-allocation of $253 million from funds the FAA already had in another account. The sequester also slashed budgets for Federal Parks, Head Start early education, Meals on Wheels, public defenders and many other services in which civil servants have had their hours reduced. The light display was set up just after dusk to tell the county’s leading law officials that George Zimmerman’s acquittal was not acceptable. Petitions have been circulating to demand that the DOJ charge Zimmerman with civil rights violations in the shooting death of the teenager.